IU 801 AP is composite sampler. It can collect the sample from open trench or channels, even from the depth of 25 feet without any sort of priming. Select sampling volume and sampling cycle of 15, 30, 60 or 120 minutes. Auto purging systems. IU 801 AP real time You can select no of samples / batch (up to 100), sample volume, batch start time, batch end time (real time based user programmable). Also it has facility to take sample 8 sample on real time base. Auto purging systems. 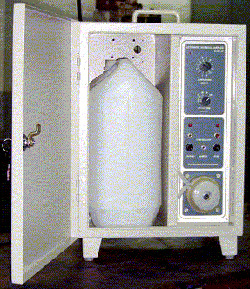 IU 802 AP 1 – 3 with 1 line and 3 collection carboy of 5 liter each / batch i.e. shift wise collection of sample. You can select no of samples or batch (up to 20), sample volume, batch start time, batch end time (real time based user programmable). Also it has facility to take sample 8 sample on real time base. This helps precise monitoring of products / effluent in each shift. Auto purging systems. Sample Time 1 to 12 Minutes in step of 1 Minute. Instrument can be installed without any Shelter, up to ambient temperature of 45 o C and humidity 95% none condensing.